Learn how to make this irresistible rub and make my recipe for Grilled Brown Sugar Chili Pork Tenderloin. We probably eat pork tenderloin at least twice a month in our home. I buy a 2-pack from Costco, make one while it’s fresh and the other goes in the freezer for a rainy day. I almost always make a Greek Pork Tenderloin… it’s easy to make and super flavorful. The other one will get grilled or sometimes I’ll get fancy and turn my oven on and roast it. I’ll season it with salt and pepper and cut a few slits in the meat and stuff it with garlic cloves. I wasn’t in the mood for either the other week and decided that I would make a rub. I love to grill the pork tenderloin. This sweet and savory rub for the pork tenderloin is out of this world delicious. I combined chili powder, smoke paprika, a little brown sugar and cinnamon. The rub and pork tenderloin turned out delicious. I paired it with baked sweet potatoes, wilted spinach and grilled black pepper asparagus. I’m all for making two vegetables with dinner each night and most nights I’ll make a salad too. I love to get our veggies in. The photos of this pork tenderloin do not do it justice, but trust me its delicious. So if your looking to switch up your dinner regimen… try grilling a pork tenderloin with this easy to make brown sugar chili rub! Preheat grill on high heat. Clean and reduce heat down to medium. While grill is preheating make the rub. In a bowl, combine the chili powder, brown sugar, smoked paprika, and ground cinnamon. Mix well. Just pinned this one – it looks and sounds great! That rub — WOWZA. Crossing my fingers it doesn’t rain this weekend so I can make this! Gorgeous. 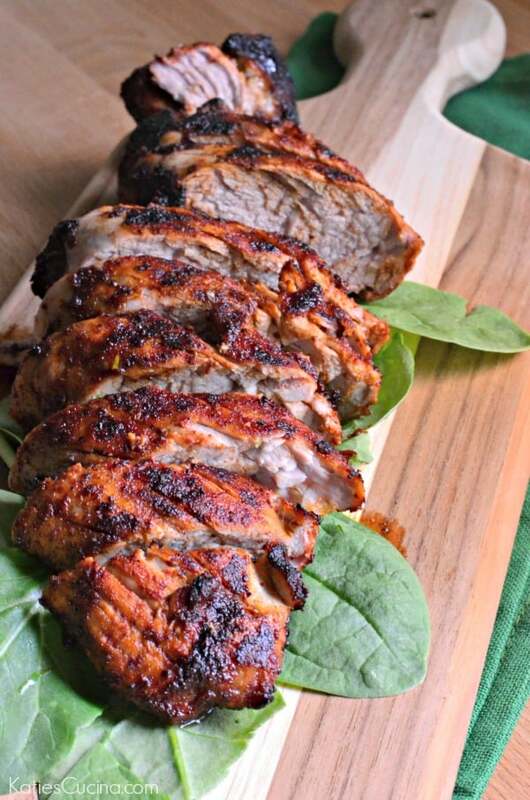 We love pork tenderloin and this looks fantastic! Thanks Anna. It’s not “pretty” looking but it sure does taste good! Yum! That rub looks fantastic. It’s so good and easy to make! The photo’s don’t do this recipe justice! I love the simplicity of the recipe for the WoW factor of the flavor. Thanks for sharing! Only change is to cook the loin to 145*F internal temp and rest for 5 minutes before cutting. Mmm! Thanks Jim. I’m old school and still like my pork cooked to 165! 😉 Yes–definitely let grilled meat rest for a few minutes. I need to add that into the recipe. Where do you get smoked paprika? I can’t find it at the grocery store. Hi Tracy, My grocery store carries it in the spice aisle. You could also try ordering on Amazon. Just finished dinner using this recipe. Wow, a fantastic meal! I doubled the rub recipe for my 4-lb loin and I used extra virgin olive oil instead of grapeseed oil. I grilled it to and internal temp of 150 degrees and it was succulent and flavorful. Will definitely make this again! Kevin, thank you for taking the time to leave a comment. I’m so glad you loved it! 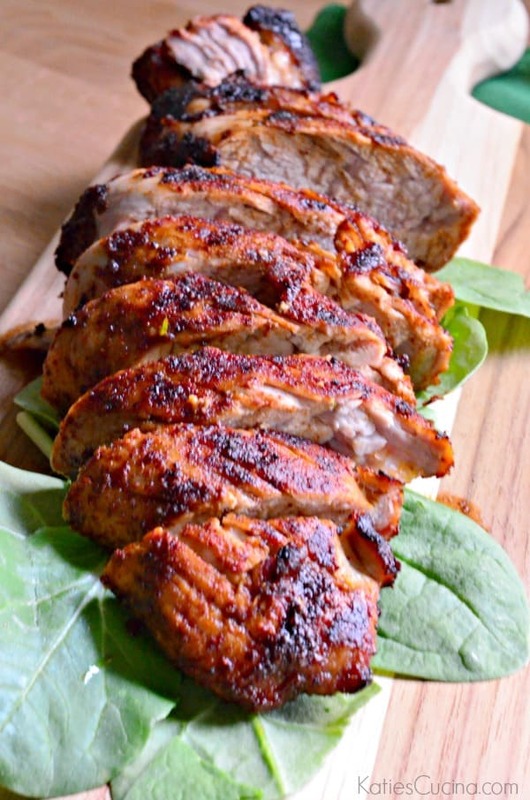 We love grilling our pork tenderloin and I love this rub recipe!!! I’m going to make this tonight for dinner. What size tenderloin do you use that can be cooked on the grill in 20 minutes? Hi Tricia, Just seeing this now. I just used a 1 lb. pork tenderloin. When in doubt use your thermometer and watch the internal temperature. Hope you enjoyed this recipe. This was fantastic! Best meal we’ve had in a long time! We agreed we’d make it again but next time maybe add a pinch of cayenne. YUM! Wendy–so glad you enjoyed my rub! Grilling pork tenderloin is my favorite! Making this tonight, but I’m trying it in the slow cooker because I love how pork turns out in the slow cooker. Smells so good already!!! Oh Cari, what a great idea! I think I’m going to need to give this recipe a try in the slow cooker! Hi, This recipe looks amazing! Sadly I don’t have a grill. I am wondering how I might be able to do this on the stovetop. I don’t think I’ll have time to use the crockpot and honestly have no idea about the broiler in my oven. Any thoughts. Thanks in advance! Hi Norah, this is a delicious rub! You could bake the pork tenderloin to enjoy all the flavors of the rub. I would suggest searing on the stove top first for a few minutes then pop in the oven at 400 degrees Fahrenheit for about 20 minutes until internal temperature is at least 145 degrees. Happy cooking!